The all-powerful God we serve is interested in everything we have to say! ... This devotional prayer book is a wonderful reminder for the boys in your life to talk to their heavenly Father about whatever is on their mind. Dozens of just-right-sized prayers touch on topics that resonate with readers ages 8 to 12. Topics include: Forgiveness, Friendship, Joy, Serving, The Future, Difficult Times, Thankfulness, Trust, and more. 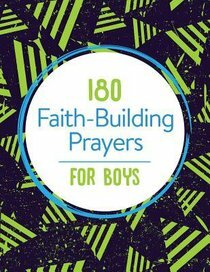 About "180 Faith-Building Prayers For Boys"
Author Janice A. Thompson lives in the Houston area. In 2004, her two oldest daughters both received proposals within weeks of each other. The weddings came off without a hitch! Janice has since coordinated weddings for friends and is thrilled to incorporate many of her adventures into her novels.